2X BNWT AUTHENTIC GENUINE UNIQLO X DORAEMON X TAKASHI MURAKAMI SOFT PLUSH TOYS! Up for sale is2 GENUINE BNWT Takashi Murakami x Doraemon / Uniqlo - Limited Edition Plush Toys. Bought from Uniqlo in London. Doraemon ― Gadget cat from the future (Volume 2) Shogakukan English comics!! 8" DORAEMON BLUE AND WHITE SILKY MATERIAL CAT WITH RED COLLER AND BELL. FACIAL FEATURES SHOW HIM SLEEPING. Doraemon plush.22cm. Condition is Used. Dispatched with Royal Mail 2nd Class. (, red hard plastic nose and stuck-on felt eyes - you can see a little glue there :-). In excellent very clean preowned condition. Doraemon ― Gadget cat from the future (Volume 3) Shogakukan English comics!! Doraemon Battery Operated Walking Plush Toy/Soft Toy/Doll. In a good used condition apart from the velcro on the battery pouch is coming loose. To operate - open the tail flap at the back and turn him on - then press the "Push" button on his hand. DORAEMON LARGE DOLL!!! UK SELLER!!! 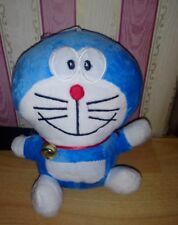 DORAEMON LARGR DOLL! Large Size. 43cmH x 40cmW x17cmD. THE MOVIE : Nobita and the Haunts of Evil LIMITED EDITION BY LAWSON. LAWSON 2014. UK DESPATCH. SOFT PVC MASCOT. FINAL FANTASY >. BODY HEIGHT 2.5" 6.5cm. ONE PIECE >>>>. Be aware! Everyone's favorite little heroine from the Doraemon series is coming to Figuarts ZERO. Shizuka Minamoto appears in her signature pink outfit and pigtails. Bears Official Bluefin Distribution Logo. This product is subject to specific safety warnings. THE MOVIE : Nobita and the Haunts of Evil LIMITED EDITION BY LAWSON. LAWSON 2014. UK DESPATCH. SOFT PVC MASCOT. FINAL FANTASY >. Be aware! ONE PIECE >>>>. GUNDAM >>>>>>. If I don't know about it I can't do anything about it. New no tags DORAEMON Pea Pod. Japanese Cartoon Anime Plush Toy Collectible. Combined postage offered. Please visit our other listings. Thank you! Original Genuine STARLIGHT TAMBOURINE - KIRARIN REVOLUTION plus matching head-wear/mic. Quantity: 1 type only. Size: see picture, around 8cm tall. - low value and gift declaration. Doraemon Coffee Mug Coffee Embossed Blue Fujiko Pro Shogakukan TV Rare. In very good condition. No chips or cracks. Has a tiny pit near foot, please see pictures. Measures approximately 3” tall x 3 1/2” diameter. Thanks for looking! Quantity: 1 style only. Size: see picture, around 8cm tall. - low value and gift declaration. CONDITION: NEW WITH BOX MATERIAL: PLASTIC,STAINLESS STEEL、BAMBOO STORAGE BOX WITH HANDLE, EASY TO CARRY IF U BUY MORE THAN 5 ITEM, U CAN GET EXTRA 5% ITEM FEE DISOCUNT!! Animation Style Anime Character/ Show Doraemon Product Type Lunchboxes/ Thermos Modified Item No Country/Region of Manufacture Japan. THE MOVIE : Nobita and the Haunts of Evil LIMITED EDITION BY LAWSON. LAWSON 2014. UK DESPATCH. SOFT PVC MASCOT. FINAL FANTASY >. Be aware! ONE PIECE >>>>. S.I.C TOKUSATSU. Brand new Limited Edition Doraemon Medium Shirt fits size 10-12 years old and small Doraemon canvas bag. 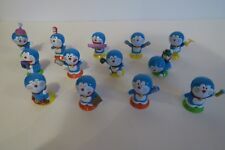 They were purchased at a special Doraemon Event at the Bishop Museum in Honolulu, Hawaii. Comes from a smoke free home. Quantity: all 4 types 4 papers. Size: see picture, each around 11.5 cm long. - low value and gift declaration. Quantity: complete 1 box, 8 styles. Size:see picture, dollhouse miniature. Condition:All new mint in original box. Never been opened. - low value and gift declaration. You will be greatly appreciated. We will surely solve the problem for you satisfactorily. W.J Co. Ltd.
Great image of Doraemon training Nobita-kun to use Esper Cap. Four layer cel. Cel is in excellent condition with very minimal traceline fade. Cel and background are stapled together at top. We also include lots of scans and pictures. Quantity: 4 types, 4pcs only. ( #1, #4, #8 and #9 ). Size:see picture, dollhouse miniature size. Condition:NO BIG Box, Include small box opened for taking photo once. Plastic bag unopen. Never been played. The Doraemon Exhibition Tokyo 2017 features work by 28 artists who were given the instructions, “Create your own original Doraemon.”. The main visual, a work by Takashi Murakami, has been made into a toy. Doraemon Post Office Umbrella BRAND NEW!! Co ndition:Include small box opened for taking photo once. Plastic bag unopen. Never been played. - low value and gift declaration. Release Date： February 2019. Country/Region of Manufacture Japan. Target Age：5 and up. Type： Educational toys. Condition : NEW. Size： W 9.5 x H 16.5 x D 2.5 cm. Doraemon Sitting, Looking Back Plush! + 1 Entry for Mystery Giveaway!